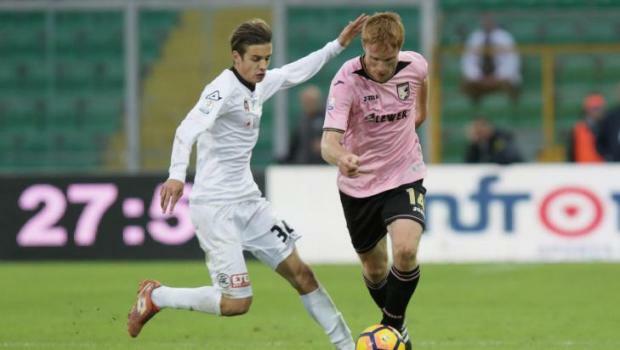 Juri Cisotti (left) played 45 games in the Italian Serie B.
BOV Premier League side Mosta have acquired the services of forwards Sam Falou and Juri Cisotti, who signed a two-year deal with the Blues, on Tuesday. Both negotiations managed to go through thanks to the excellent relationship that Mosta's Sports Director Max Leghissa enjoys with various agents in his native Italy. Cisotti is among the Blues' biggest signings for this season, as the 25-year old boasts 45 games in the Italian Serie B during his spells at Spezia, Latina and Triestina. The Italian forward featured also 36 times for Chievo Verona Primavera before heading into senior football. Meanwhile, 21-year old Falou, who started out his career at Genoa, was on the books of Reggina during the second half of the 2017/2018 season, where he made seven appearances in the Serie C after joining from Ravenna for whom he played 15 games with 3 goals. Previously, he also featured for Ancona (21 games, 3 goals) and Mantova (12 games, 1 goal) in the Italian third tier. Mosta have been looking to strengthen their attacking department as that the moment they have only natural striker in Brazilian Renan. Enrico Piccioni's side have earned three points after their first couple of outings after losing to St Andrews (1-3) and beating Senglea Athletic (2-0). Senglea Athletic are in search of a new coach after parting ways with Italian tactician Bruno Russo. The dismal start to the 2018/2019 championship cost Russo his job as the Cottonera outfit are striving to salvage their top tier status for a second straight year. Club's president, Ruben Debono, confirmed with timesofmalta.com that they are looking to bring in a new coach as soon as possible.